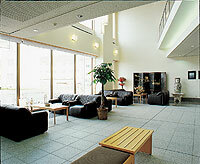 Hotel Okabe Shiosaitei is a modern hotel located in Wakkanai City and close to the coast and with convenient transportation. All guest rooms are equipped with bathtubs, showers and toilets as well as air-conditioning. Guest rooms for handicapped person are also available. 6 minutes walk from JR Wakkanai Station. 3 minutes by taxi from Ferry Terminal.